Resolutions passed for the establishment of the Hindu Nation in Bharat and Nepal besides complete ban on Cow-slaughter, stopping insurgence from Bangladesh and protection of the Hindus world over ! Panaji – Bharat and Nepal are self-materialised Hindu Nations. Every sect has a Nation that it calls its own. However, Hindus do not have a single Nation which they can call as their own. And hence, the Third All India Hindu Convention passed resolutions for the establishment of the Hindu Nation in Bharat and Nepal besides resolutions for a complete ban on Cow-slaughter, stopping insurgence from Bangladesh and finalisation of the policy for the protection of the Hindus world over. This information was given by the National Guide of Hindu Janjagruti Samiti H.H. Dr Charudatta Pingale during the press conference held here today. The conference was also attended by Prof. Madhav Bhattarai, the ‘Rajguru’ of Nepal and President of the Rashtriya Dharmasabha. Four hundred representatives of over 125 Hindu organisations from 20 States in Bharat as well as representatives from Bangladesh and Nepal participated in the Convention. As per the ‘Common action Programme’ finalised during the Convention, it has been decided to organise 80 regional Conventions across 20 States and ‘Public Hindu Dharmajagruti Sabhas’ at 100 venues. H.H. Dr Pingale also informed that a decision has been taken during the Convention to work unitedly for providing assistance during the natural and man-induced calamities, and to implement a programme of ‘Self-defence training classes’ for strengthening of the Hindus. 3. Act banning religious conversion in order to preserve Hindu race. 3. Awarding stringent punishment to those sheltering and providing help to intruders from Bangladesh. Mr Anil Dhir, National Secretary-General of Bharat Raksha Manch said that Hindu organisations have decided on the programme to implement a crash campaign to deport Bangladeshi intruders on the basis of prevalent Acts. Mr Virendra Ichalkaranjikar, President of Hindu Vidhidnya Parishad informed that the Hindu Vidhidnya Parishad will be providing legal assistance and legal guidance for the programmes to be undertaken in the interest of the Nation and Dharma to devout Hindu organisations in 9 States. 1. This Convention supports morally, politically and at all the levels the local Hindus, who are making efforts so that Nepal be declared as a Hindu Nation. 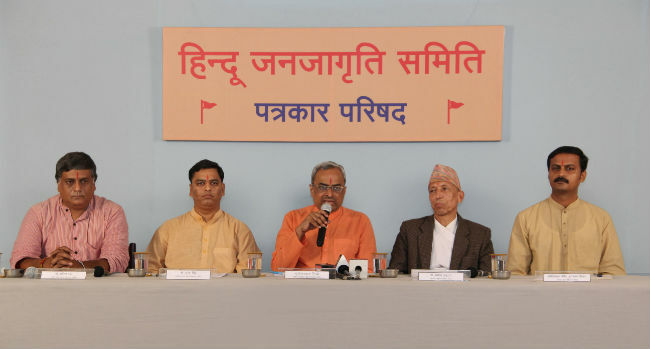 3.The Secular Government of Bharat should not interfere directly or indirectly to crush the future movement to force the Nepal Government to declare Nepal as a Hindu Nation. Resolutions passed in the third ‘All India Hindu Convention’ ! ‘Uniform Civil Code’ should be enacted in the Nation. The Convention demands that Common Civil Code according to the judgement passed by the Supreme Court should be enacted as soon as possible. 1. On immediate and strict implementation of the Act to ban cow-slaughter all over the country. 2. Strictly ban breeding, import and rearing of cows of foreign breed. 3. Cow should be declared as National animal. 1. In view of the increase in the rate of religious conversion of Hindus all over Hindustan, Union Government should legislate effective law pertaining to religious conversion. 2. If anybody is converted by hatching a conspiracy, forcibly or through allurements, the individual responsible for the conversion should be given life term. If the converted individual happened to be minor, criminal responsible for the conversion should be awarded capital punishment. 3. Missionaries should not be allowed to perform social services, which may be conducive to religious conversion. 4. Christian missionaries should be banned from running orphanages or performing any other social service in tribal areas. 5. Other religious organisations should not distribute religious literature without the permission of the Government. Above demands should be fulfilled immediately. Bharat be declared a Hindu Nation ! 2. This Convention is committed to giving all possible assistance to those, who will make efforts to make Bharat a Hindu Nation. This entry was posted in Featured, General, Hinduism, Pro Hindu, Speeches and tagged All India Hindu Convention, Hindu Adhiveshan. Bookmark the permalink.